A scandalous proposition only a rake would accept! The Honourable Clarissa Warrington despairs when her beautiful, foolish sister becomes the latest female to set her cap at the ton’s most notorious rake. For Amelia’s sake, Clarissa must act fast… The devastatingly attractive and wealthy Kit, Lord Rasenby, is bored. London society holds little excitement for him, so the incurable womaniser is tempted by a most unusual offer. If he can provide the intriguing Clarissa with the adventure of a lifetime, she will provide him with – herself! No self-respecting rake could turn such an offer down! 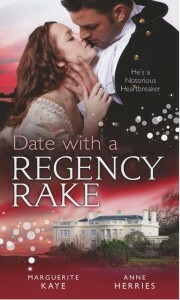 Also available in the UK in the Date with a Regency Rake anthology, with an additional story from Anne Herries. You can read more about the background to the book and my research here.